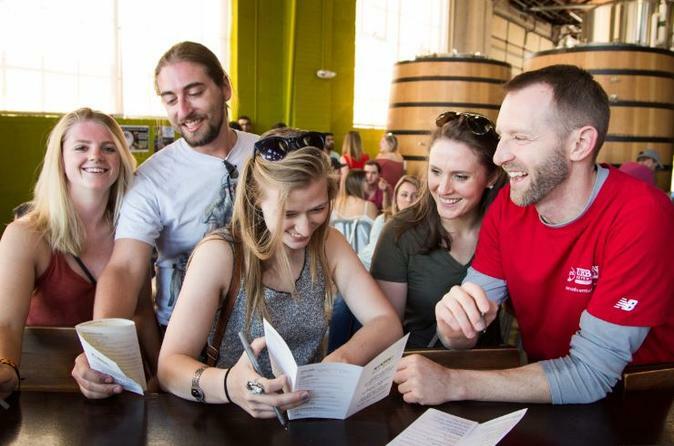 Discover your new favourite craft beer, cider or gin on this fabulous food and drink tour of Denver’s most exciting and up and coming neighbourhood, the River North Art District or RiNo as it’s better known to locals. Get a full appreciation of the art of brewing and distilling beer, cider and spirits as we stagger our way through a trendy distillery, a buzzing brewery and an exceptional cider house. Throw in dinner at a hip, local restaurant and we have got a fool-proof recipe right here for your best night out in Denver! Drink and eat your way through the best of Denver’s hippest new neighborhood. Visit a local cidery, brewery AND distillery all in ONE tour! Enjoy an experimental dinner at one of the trendiest eateries in town and get to know your fellow trip dwellers. Support an exciting new Denver start-up company by catching a rideshare across town with Hovit. Find out where the hottest new shops, restaurants and bars can be found from your local, in-the-know Guide. After meeting up with your local Guide, we will make our way over to the River North Art District - RiNo - using the ingenious Denver-only rideshare company Hovit. RiNo is an achingly hip, up and coming neighbourhood that boasts a serious number of creative businesses and fun start-ups, without a chain store in site. Our first stop will be one of Denver’s newest and most popular distilleries. Serving an impressive array of flavoured, seasonal gins and exceptional vodka amongst other ‘spirited’ drinks, no detail is overlooked by this family-run establishment. We will enjoy the bar and terrace area (weather permitting) as we sip superb liquors made from top quality local grains and fruit. Next up it’s time to experience what Denver is famed for – its’ unbelievably good craft beer scene. We’ll make our way to our absolute favorite local brewery to sample a flight of beers. The large tanks inside may look ultra serious but don’t be fooled – this establishment may well be the most fun place in Denver to hang out on a summer evening and you’ll get to see why the locals love it so much. After boozing on liquor and beer, we think it’s time to get some food in to you! And not just any food will do, we are going to take you to a place that has become a magnet for foodies all over Denver, where we’ll enjoy some locally sourced gastro delights that will show you why Denver is gaining a strong reputation as a fabulous foodie hotspot. But wait - we’re not done yet! A short walk after dinner will take us to a beloved local Cidery, to try a uniquely dry style of cider. You will love the rare flavor profiles and interesting variations that this joint specialises in, so prepare to be wowed! As we finish our rounds, you may find that you want to stay out and play and we wouldn’t blame you one bit, RiNo is AWESOME! We can leave you to marinate and find your own way home (we’re always happy to advise on the best way to do so!) or, if you decide to stick with us, we’ll drop you back near the Union Station area where there’s plenty more to see, do and drink during the rest of your dynamite Denver night out. Cheers!